Earth Day in Union Square 2014. When: Friday and Saturday, 10 a.m. to 6 p.m. and Sunday, 1 to 5 p.m. When: Friday at 8:30 p.m., Saturday from 9 a.m. to noon, Sunday 11 a.m.
Join the Friends of Inwood Hill Park and Recycleday Morning for the first-ever Inwood Hill Thaw at Inwood Hill Park. Meet other volunteers and residents as they work to green up the streets of Northern Manhattan for Earth Day. When: 10 a.m. to 5:45 p.m. The Guggenheim Museum presents “A Year with Children,” an annual presentation showcasing the work of students across several public schools in New York City. This year’s participating schools include Manhattan P.S. 28 from Washington Heights, P.S. 38 from East Harlem, P.S. 42 from Chinatown, P.S. 86 from Kingsbridge in the Bronx, P.S. 48 from Staten Island, P.S. 88 from Ridgewood and P.S. 130 Bayside from Queens, and Brooklyn’s own P.S. 8 Brooklyn Heights and P.S. Prospect Heights. The exhibit will be on view through June 12, 2016. 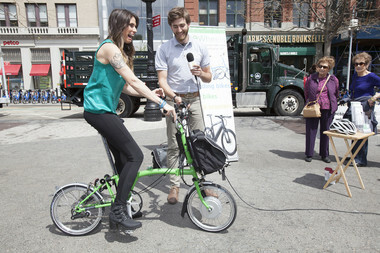 Celebrate Earth Day with the #CarFreeNYC intuitive along Wadsworth Ave. in Washington Heights. There will be dozens of activities for families, including a theater workshop, tennis demonstrations, Zumba classes and bike riding lessons. A Central Park Conservancy staffer will lead a guided 90-minute tour through the Shakespeare Garden, which is turning 100 this month. Tickets are $35 or $20 for members. See this spring’s blooms during a walk led by Roosevelt Island Historical Society President Judith Berdy. Suggested donation is $12. RSVP at 212-688-4836 or email rooseveltislandhistory@gmail.com. Join Jason Kendall and Donna Kendall Stearns for their weekly free readings, Shakespeare Saturdays. The group, which has been running since 2004, is celebrating its 400th year since the famous playwright’s death. When: 1 p.m. to 6 p.m. Check out the works of several local photographers, based on the theme of their own “point of view,” making the seemingly mundane personal. The Josephine Herrick Project this spring hosted a photography program for teens from NYU’s "Step Up" program for youth impacted by poverty, encouraging the kids to explore their neighborhoods and document their unique perspectives with a camera. The resulting photographs will be on display this Saturday at the Seaport District. Treadwell Park is celebrating the 500th anniversary of “Reinheitsgebot,” or the German Beer Purity Law, which stated that beer can only contain water, barley and hops. To celebrate, Treadwell Park challenges customers to a beer stein hoisting competition with brewmaster Udo Schiedermair. Modern polka players will perform jazzy versions of standard classics and there will also be a Reinheitsgebot trivia contest. When: Noon to 7 p.m. Celebrate Earth Day in Union Square with live performances, activities for kids, and interactive displays about people doing innovative work to save the planet. When: Sunday, April 24 from 2 to 4 p.m.
Local organization “Save Chelsea” is hosting a historic tour of the neighborhood. The walk covers the blocks between West 23rd and West 30th streets. Urban historian Laurence Frommer will lead the tour, which “[takes] into account not just the area’s rich history, but the practical requirements of ensuring the integrity of unprotected locations such as historic Tin Pan Alley. Treat your ears to a number of favorite and lesser-known opera songs, including arias, duets and trios from Verdi’s “Rigoletto” and “Il Trovatore,” Puccini’s “Tosca,” and even “West Side Story,” by Bernstein. Soprano Kathy Favazza, mezzo-soprano Sara Murphy, tenor John Tiranno, and pianist Brian Holman will perform. Suggested donation is $20 per person and $15 for students and seniors. These listings were compiled by DNAinfo's Manhattan reporters: Emily Frost, Noah Hurowitz, Carolina Pichardo, Irene Plagianos, Maya Rajamani, Danielle Tcholakian and Shaye Weaver.